Hepatitis Monthly - Resveratrol: Is It Really Good for Liver Health? Resveratrol: Is It Really Good for Liver Health? To Cite: Weiskirchen S, Weiskirchen R. Resveratrol: Is It Really Good for Liver Health?, Hepat Mon. 2017 ; 17(8):e12074. doi: 10.5812/hepatmon.12074. Context: Resveratrol is a natural occurring stilbene present in a limited number of dietary food products and beverages. It is assumed that resveratrol has health-promoting effects by lowering low-density lipoprotein (LDL) cholesterol, improving microcirculation, and inhibiting platelet aggregation. Altogether, these beneficial effects lower the risk of cardiovascular disease. The “French paradox” assumes that a diet with moderate consumption of red wine lowers the risk of cancer and cardiovascular disease. Based on its healthful activities, a large number of studies were performed during the last decades investigating potential biological effects of resveratrol on liver homeostasis and its potential application as a hepatoprotective drug. 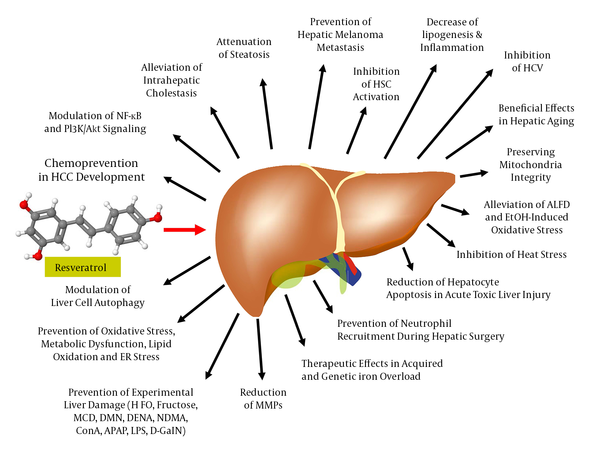 Objectives: The current study aimed at discussing the proposed therapeutic attributes of resveratrol on liver health and its postulated mode of activity. Evidence Acquisition: To conduct the current study, the PubMed full-text archive depository for articles presenting data on resveratrol in liver health and disease was searched. Results: Out of the 9268 published articles on resveratrol, a total of 742 articles focused on liver. Among them, 352 articles investigated potential therapeutic activities. Although some of the reported in vitro and in vivo benefits of resveratrol were highly encouraging, well-designed clinical studies were missing. Conclusions: Presently, it is still premature to advise nutritional supplementation of resveratrol to cure hepatic diseases. Moreover, uncritical recommendation to drink wine as a liver health-promoting beverage should be avoided. 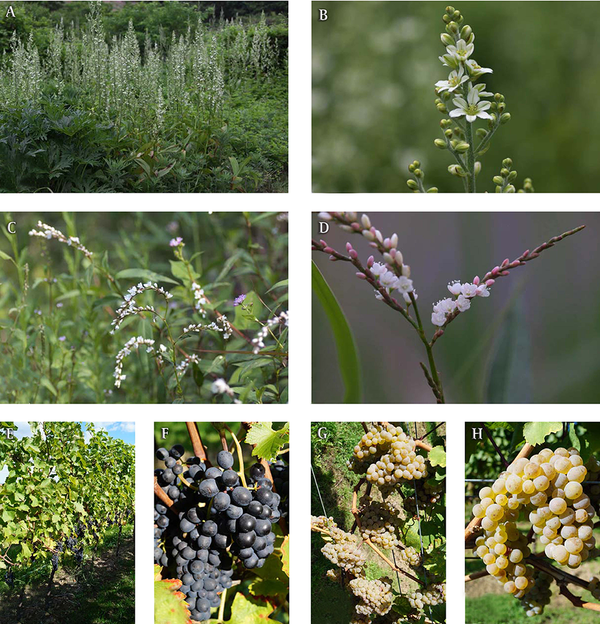 Resveratrol (RES) is produced in several plants after pathogen infection. As a phytoalexin, it protects the plant by attacking pathogens by its antimicrobial and antioxidative activity. RES exists as 2 geometric isomers in which the 2 phenolic rings are either arranged in a more stable trans-configuration or in a cis-configuration produced by ultraviolet (UV) irradiation of the trans-isomer (Figure 1). RES was first discovered in 1939 by the Japanese scientist Michio Takaoka in the roots of the white hellebore (1) (Figure 2A and 2B). The highest concentrations of RES are found in the herbaceous perennial Japanese knotweed (Figure 2C - 2D). In traditional Chinese medicine products, this plant, Hu Zhang, is the ingredient of many diuretic acting teas to treat cough, hepatitis, jaundice burns, and amenorrhea. RES is also found in many other plant fruits and vegetables including grapes, apples, raspberries, blueberries, plums, tomatoes, peanuts, and pistachios (2). The concentration of RES in white wines produced from the grape varieties such as White Burgunder, Riesling (Figure 2E and 2F), Ortega, and Gewürztraminer is about 10 times lower than that of RES quantities in wines made from the red grape varieties such as Cabernet Mitos, Cabernet Cubin, Syrah (Figure 2G - 2H), Pinot noir, Cabernet Sauvignon, and Merlot (2). The stilbenoid reveratrol forms 2 naturally occurring isoforms; ie, trans-Res (E-RES, CAS 501-36-0) and cis-Res (Z-RES, CAS 61434-67-1). The trans-isomer can be transformed into the cis-form by subjecting to UV light. A, B, resveratrol was first isolated from the roots of the white hellebore Veratrum grandiflorum representing a plant that forms typical inflorescences; C - D, highest resveratrol concentrations are found in the Japanese knotweed (Polygonum japonicum or Polygonum cuspidatum) that is also known as Mexican Bamboo. Resveratrol in E - F, red and G - H, white grapes typically reach concentrations of up to 2 - 3 mg and 0.2 - 0.5 mg/kg fresh weight, respectively. Details about RES concentrations in more food products and beverages are given elsewhere (2). In the last decades, a large wealth of experimental and preclinical studies were conducted and concluded that RES was a non-toxic, cardioprotective compound evolving chemopreventive activities in the setting of diverse cancers. A more fundamental study showed that RES extended the lifespan of lower organisms by activating members of the conserved sirtuin protein family implicated in the control of aging (3). From the chemical prospective, RES similar to many other naturally occurring substances exhibits radical scavenger and anti-oxidant properties (4). An article analyzing epidemiologic characteristics of coronary disease in France came to the conclusion that RES and other phenolic components in food and beverages might account for the so called “French paradox” (5). This catchphrase summarizes the absurdity that France has a significantly lower mortality incidence of coronary heart disease than other countries, although French people consume higher levels of dietary saturated fat and smoke more cigarettes than other populations. Later, moderate red wine drinking over a long period was suggested to protect against coronary heart disease accounting for this paradox finding (6). This assumption was further confirmed and propagated in a report in 2008 in the renowned journal “Hepatology” in which the prevalence of nonalcoholic fatty liver disease (NAFLD) in 7211 non-drinkers with 945 modest wine drinkers was compared (7). The detailed multivariate analysis adjusted for age, gender, race, physical activity and other variables of this study came to the final conclusion that “Modest wine consumption is associated with reduced prevalence of suspected NAFLD”. The current review study aimed at discussing the studies analyzing potential liver health-promoting effects and presenting a perspective of RES activities. It further highlights the relevance of RES in the therapy of experimental and human liver disorders and provids information about past and ongoing human clinical trials investigating aspects of RES on liver pathogenesis. The structures of cis- and trans-RES were prepared with the open-source Java viewer for chemical structures in 3D (version 14.2.15) using the structure information deposited in the PubChem database (https://www.ncbi.nlm.nih.gov/pccompound/) under CAS nos. 501-36-0 (trans-RES) and 61434-67-1 (cis-RES), respectively. PubMed searches were performed at the National Center for Biotechnology Information (https://www.ncbi.nlm.nih.gov/) using the search terms (i) “resveratrol”, (ii) “resveratrol and liver”, and (iii) “resveratrol and liver and therapy”. The sorting for publication years was done with the “publication dates” filter in which the custom range was set from 01 January to 31 December for each year. The search was done on 02 February, 2017. In total, 9268 articles were identified out of which the first entry in PubMed was from year 1978 (PMID: 649051) and the last from the beginning of February 2017 (PMID: 28274416). Papers supporting novel findings in regard to health-promoting effects of RES in liver were selected and discussed. The registry and results database for clinical studies (https://clinicaltrials.gov/) were searched on 23 April, 2017 for studies including the search terms “resveratrol” and “liver”. The photos of Veratrum grandiflorum and Polygonum japonicum were reproduced from the website “Wild plants in and around Shimane” (http://wildplantsshimane.jp/) with kind permission from Hiroshi Moriyama. The images of red and white grapes were photographed during the 2015 wine harvest in Martinsried, Pfalz, Germany. The 3 images illustrating the interaction of RES molecules with SIRT1 were generated with the web application NGL Viewer for molecular visualization (8) using the crystal structure coordinates of human SIRT1 along with RES and an AMC-containing peptide deposited in the RCSB Brookhaven PDB Protein Data Base (www.rcsb.org/) under accession no. 5BTR. 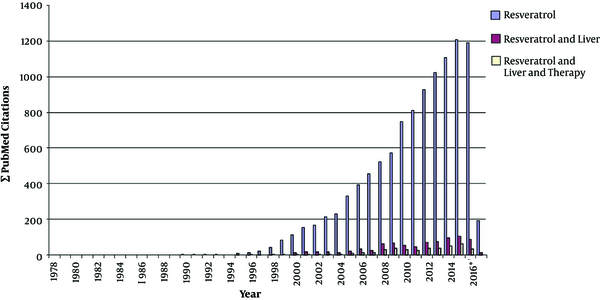 Driven by connection of RES with the French paradox in the late 1980s, the publication output on RES significantly increased from year to year. A PubMed search performed at the end of February 2017 resulted in the identification of 9268 articles including the search term “resveratrol” (Figure 3). Accordingly, 742 (12.5%) of these articles further included the term “liver” out of which nearly half of them (in total 352) investigated therapeutic issues of RES in the liver. Most of these studies showed RES application of health-promoting effects in the setting of a large variety of experimental conditions (Figure 4). In the following, some of the most prominent therapeutic activities of RES in liver pathology are briefly summarized. A PubMed search for the terms (i) resveratrol, (ii) resveratrol and liver, and (iii) resveratrol and liver and therapy was done. Please note that the studies analyzing biological or therapeutic functions of RES significantly increased after formulation of the “French paradox” in the 1980s. This term spread through a variety of mass media and assumes that a diet based on Mediterranean cuisine enriched in omega-3 oils, antioxidants and supplemented with moderate consumption of red wine lowers the risk of cancer and cardiovascular disease partly through increasing HDL cholesterol whilst reducing LDL cholesterol. * Please note, during performing the PubMed searches (conducted in February 2017) not all articles from year 2016 were already listed in the depository. In the liver, RES ameliorates lipid accumulation, oxidative stress, inflammation, attenuates mitochondrial dysfunction, and endoplasmic reticulum (ER) stress, evolves favorable effects on hepatitis C, counteracts iron overload, improves drug and alcohol toxicity, relieves metabolic disturbances, modulates cell autophagy and apoptosis, and acts as antitumorigenic, and antifibrotic agent. In a large number of experimental models of liver injury, RES limited or prevented hepatic damage. Abbreviations: APAP, acetamionphen; ConA, Concanavalin A; DENA, diethylnitrosamine; D-GalN, D-galactosamine; DMN, dimethylnitrosamine; HFD, high-fat diet; LPS, lipopolysaccharide; MCD, methionine-choline deficient diet; NDMA, N'-nitrosodimethylamine. Most of the experimental studies on RES were conducted in rodents either challenged with direct hepatotoxins or subjected to nutritional diets given rise to progressive liver damage. In 1 study, the oral administration of RES at 20 mg/kg daily for 4 weeks in rats prevented diethylnitrosamine (DEN)-induced body and liver weight loss, inhibited the elevation of serum parameter associated with the liver insult (eg, alanine transaminase (ALT), aspartate transaminase (AST), alkaline phosphatase (ALP), bilirubin), and reduced activation of hepatic stellate cells (HSC) and collagen expression (9). Similar results were obtained when rats were treated with higher RES concentrations (40 mg/kg) for shorter time periods (7 days) (10). In another study, RES dose-dependently (50, 100, and 300 mg/kg) attenuated DEN-initiated liver tumorigenesis in rats (11). The beneficial effects of RES in this study were indicated by suppression of hepatic heat shock protein 70 (HSP70), cyclooxygenase-2 (COX-2) expression, and activity of nuclear factor kappa-light-chain-enhancer of activated B-cells (NF-κB) p65 nuclear translocation indicating destructive cell damage. In male C57BL/6 mice, RES at 6 mg/kg given 4 hours post-injury was therapeutically effective to prevent carbon tetrachloride (CCl4)-induced liver damage. In this experimental setting, RES prevented hepatocyte apoptosis by reducing caspase 8 and caspase 3, and lowering the content of injury-induced CXCL10 elevations in serum (12). Similar protective effects of RES were also found in rats challenging with CCl4 (13). In the respective model, an intragastrically administered grape-stalk extract, equivalent to a daily dosage of 3 mg RES/kg body weight, lowered induction of CCl4-induced lipid peroxidation when administered for 14 consecutive days. Similar hepatoprotective effects of RES were observed in a rat model of acetaminophen (APAP)-induced hepatotoxicity given in a single dose (14). In vivo, RES at 30 mg/kg significantly reduced ALT and total bilirubin levels and further promoted hepatocyte viability in vitro. Similar results were found in APAP-treated C57BL/6 mice pretreated with RES 50 mg/kg body weight showing that RES had beneficial effects through its antioxidant effects and by preventing mitochondrial and nuclear DNA damage (15). Recently, beneficial effects were reported in a rat model of ethinylestradiol-induced intrahepatic cholestasis of pregnancy (jaundice in pregnancy), in which the application of RES by oral gavage at 15 mg/kg of body mass per day for 3 consecutive days restored bile flow, lowered serum transaminases, and increased total bile acid concentrations, which is presumed to increase the flux of total bile acids from the mother to the fetus (16). In pregnant rats, RES given orally at 20 mg/kg/day throughout pregnancy significantly decreased maternal leptin and improved maternal, fetal, and placental oxidative stress markers in a model of protein restriction that produces maternal and offspring metabolic dysfunction (17). Moreover, oxidative stress biomarkers also decreased in maternal and fetal liver, suggesting that the intake of RES seems to be therapeutically effective when fetal nutrition is impaired during pregnancy and highly beneficial to overcome offspring metabolic dysfunction. The beneficial effects of RES in iron-overload-mediated liver disease were recently investigated (18). By a genetic hemochromatosis (ie, the hemojuvelin null mice) and a non-genetic murine model (iron injection) of hepatic iron overload, the dietary supplementation with RES prevented iron-mediated hepatic injury including oxidative stress, fibrosis, and steatosis. Although RES treatment did not affect hepatic iron content per se, the authors of the respective study suggested that RES represented an economically feasible therapeutic effective drug protecting the liver from iron-mediated injury (18). A Spanish investigation conducted in a melanoma metastasis model found that a daily oral dose of 1 mg/kg RES inhibited hepatic retention and metastatic growth of melanoma cells (19). In this model of cancer cell injection, RES prevented interleukin (IL)-18 augmentation in the blood of melanoma cell-infiltrated livers and inhibited IL-18-dependent expression of VCAM (vascular cell adhesion molecule)-1 by tumor-activated hepatic sinusoidal endothelium thereby interfering with melanoma cell adhesion to the microvasculature (19). Hepatic fibrogenesis is primarily driven by HSC. During the phases of hepatic insult, these cells are activated and acquire a contractile myofibroblastic phenotype with the capacity to express large quantities of collagen. In vitro studies performed in an immortalized rat HSC cell line (ie, HSC-T6) showed that RES at 0.78 to 200 µM significantly inhibited cell viability, while the pretreatment with RES decreased α-smooth muscle actin, collagen type I, and nuclear translocation of NF-κB in cells stimulated by lipopolysaccharides (LPS) (20). These effects were accompanied by a significant inhibition of inflammatory markers including Toll-like receptor 4 (TLR4) and myeloid differentiation primary response gene 88 (MyD88) (20), both strongly associated with the transmission of inflammatory signals. Quite similar effects were observed in a human HSC cell line (ie, LX-2). In these cells, RES inhibited fibrosis-associated genes and further was effective in preventing activation of NF-κB and PKB/Akt (21). The inhibition of fibrotic transdifferentiation of HSC by RES was also established in an in vivo rat model in which hepatic fibrosis was induced by N'-nitrosodimethylamine (NDMA) (22). In this model system, the supplementation with RES subsequent to NDMA administration restored liver architecture, prevented oxidative damage, and blocked expression of fibrotic marker genes in HSC (22). In mice receiving chronic ethanol feeding, RES treatment reduced lipid synthesis and increased rates of fatty acid oxidation (23). These beneficial effects on ethanol toxicity were associated with increased circulating adiponectin levels and increased mRNA expression of the hepatic adiponectin receptors AdipoR1 and AdiopoR2. While the authors concluded that the therapeutic effects of RES were mediated by a stimulatory effect on hepatic SIRT1-AMPK signaling (23), other experiments performed in rats chronically subjected to alcohol for 6 weeks, suggested that most of the therapeutic effects of RES were mediated by inhibiting oxidative damage induced during the phases of chronic ethanol consumption (24). Highly beneficial therapeutic effects of RES supplementation were also shown in the pathogenesis of hepatic dysfunctions following hyperthermic challenge (25). When rats were heat-exposed in a hot chamber for about 10 to 15 minutes, the pretreatment with RES resulted in normalization of heat-induced hepatotoxicity using lipid peroxidation, antioxidant enzyme activities, and tissue damage as read-out systems (25). Therefore, RES supplementation counteracts increased free radical formation under these conditions. A comparative study in young and old C57BL/6J mice revealed that the therapeutic effects of RES might be more prominent in aged livers (26). These livers per se showed elevated expression of pro-inflammatory markers. In livers of aging animals, RES treatment reduced expression of IL-1β, tumor necrosis factor (TNF)-α, and genes associated with the NALP-3/NLRP3 inflammasome branch, while the effects were negligible in the livers of young or mature mice (26). Therefore, dietary RES supplementation might specifically slow aging processes in the liver by blocking endogenous inflammation during hepatic aging. In rats that received partial hepatic ischemia for 1 hour, the post-ischemic intravenous administration of RES 5 minutes before starting reperfusion resulted in a significant decrease in liver insult (27). It was indicated in lowered levels of aminotransferases, IL-1β, and IL-6. Most interestingly, hepatic neutrophil recruitment and expression of heme oxygenase-1, TNF-α, and keratinocyte chemoattractant (KC, CXCL1) were significantly lowered after RES administration. Therefore, the authors proposed that RES was particularly suitable to prevent inflammation secondary to hepatic surgery or liver transplantation. Non-alcoholic steatohepatitis (NASH) is a severe form of NAFLD. The tissue histology is mainly characterized by inflammation and liver cell damage along with massive hepatic fat builds. Experiments conducted in methionine/choline deficient (MCD) diet fed C57BL/6 mice, RES administration alone was sufficient to decelerate NASH progression (28). The drug impacted the expression of genes involved in autophagy linking RES to processes responsible for the orderly degradation and recycling of cellular components during NASH. Furthermore, in vitro experiments in HepG2 cells showed that RES dose-dependently reduced palmitate-induced cellular lipid content and accumulation, while the stilbene itself had no effect on cellular lipid content and accumulation (29). In the same study, RES reduced the weight of high-fat diet (HFD) fed mice without influencing the overall animal's food intake. The authors linked some of the RES effects to autophagy and the cAMP-PKA-AMPK-SIRT1 signaling pathway (29). Similarly, RES treatment reduced body fat content, total cholesterol, triacylglycerol, and insulin plasma levels and further increased expression of SIRT1 during HFD feeding in mice (30). Rats were fed with a fructose-enriched diet for 12 weeks, the administration of RES at 70 mg/kg given orally from the 9th week till the end of the experiment improved the pathogenesis of NASH (31). Interestingly, the application of RES, when given with half the dose of fenofibrate, improved NASH-related symptoms to an extent similar to the effects obtained with a full dose of fenofibrate (31). Since fenofibrate itself exerts its therapeutic effects through activation of peroxisome proliferation-activated receptor α (PPAR-α), it is reasonable that the RES increases lipolysis and elimination of triglyceride-rich particles via this pathway. Likewise, RES increased the expression of PPAR-δ and prevented endoplasmic reticulum stress (ER) during hepatic steatosis in obese rats induced by feeding an HFD (32). The first in vitro study performed in 2001 reported that RES at 100 and 200 µM inhibited proliferation of hepatoma cells and suppressed the invasion of hepatoma cells even at concentrations of 25 µM (33). Subsequent studies confirmed the inhibitory effect on cell proliferation and suggested RES as a drug inducing cellular apoptotic death via the p53-dependent pathway (34). These encouraging results were also confirmed in an in vivo model, in which Hepatoma-22 (H22) tumor cells were implanted into Balb/c mice (35). In this model, RES directly inhibited the growth of the cancer cells and further had a potential effect on nonspecific host immunomodulatory activity (35). In human HepG2 cells, the RES effects on cellular proliferation, reactive oxygen specifies formation and apoptosis were attributed to their capacity to mediate cell cycle arrest in G1 and G2/M phases (36). A direct link of RES and cell proliferation and survival pathways in this cell line was also demonstrated in another study showing RES treatment downregulated expression of cyclin D1, p38 MAP kinase, Akt and Pak1 (37). In rats challenged with DENA, dietary RES reduced hepatic lipid and protein peroxidation and elevated expression of hepatic nuclear factor E2-related factor 2 (Nrf2) representing a key transcription factor in antioxidant defense (11). Likewise, RES treatment during early and advanced hepatocellular carcinoma (HCC), induced by application of DEN, in Wistar rats revealed beneficial effects on the overall disease outcome (38). A more recent study, extended the repertoire of biological activities of RES and claimed that the effects of RES on cell growth and apoptosis were mediated by promoting a metabolic shift away from glycolysis by downregulating expression of hexokinase 2 (HK2) (39). This enzyme is a key regulator of tumor glycolysis catalyzing the rate-limiting and first obligatory step of glucose metabolism. Based on the fact that RES has the capacity to inhibit viral replication of several major viruses such as cytomegalovirus, varicella-zoster, influenza A, and herpes simplex virus (HSV), it was very surprising when Nakamura et al. reported that RES significantly enhanced hepatitis C virus (HCV) RNA replication in the HuH-7-derived cell assay system OR6 (40). However, RES on the other side prevented formation of hepatic steatosis in C57BL/6 mice infected with HCV core recombinant adenoviruses by inhibiting expression of SIRT1 and PPAR-α (41). In addition, highly beneficial effects of vitisin B (a RES tetramer) had high potency against HCV replication and exhibited synergistic antiviral effects with the established NS5B polymerase inhibitor sofosbuvir (42). In hepatitis B virus (HBV) X protein (HBx) transgenic mice, RES at 30 mg/kg/day had pleiotropic beneficial effects on intracellular reactive oxygen species, hepatocyte proliferation, and lipogenic genes resulting in a delayed HBx-mediated hepatocarcinogenesis and significantly reduced HCC incidence (43). In contrast, in a very recent study, RES activated hepatitis B virus (HBV) transcription, most likely by its capacity to stimulate SIRT proteins (see below) that both activate HBV gene expression (44). Presently, all the studies that investigated RES effects on HCV or HBV were somewhat contradictory. Therefore, it is hard to predict if RES is an effective antiviral drug to treat chronic hepatitis C or B. There are several molecular activities that convey the health-promoting effects of RES. In one of the most important (if not the decisive) studies, RES was supposed to modulate the activity of the silent mating type information regulation 2 homolog 1 (SIRT1) (3). SIRT1 belongs to a protein family consisting of 7 (SIRT1-SIRT7) individual members. They are unique Nicotinamide adenine dinucleotide (NAD+)-deacetylases. They regulate cellular energy metabolism, mitochondrial function, and modulate stress responses by interacting with multiple signaling proteins, transcriptional factors, and poly (ADP-ribose) polymerases (PARPs) (45). In the study by Howitz et al. (3), RES lowered the Michaelis constant of SIRT1 for both the acetylated substrate and NAD+. In the brewer yeast Saccharomyces cerevisiae, it further promotes cell survival by stimulating SIRT1-dependent deacetylation of p53 (3). Moreover, RES extended the life span in this microorganism by 70%, most likely by mimicking calorie restriction and increasing DNA stability. This pioneering work inspired many subsequent experimental studies and clinical trials aimed at using RES as a therapeutic drug to increase lifespan or to effectuate other miraculous effects. A great wealth of fundamental studies performed during the past years tried to dissect the molecular mechanisms by which RES modulated SIRT1 activity. Particularly, several studies were initiated to unravel the structural basis for the observed allosteric and substrate-dependent stimulation of SIRT1 activity by the stilbenoid RES. In this regard, a crystal structure of SIRT1 combined with RES and a 7-amino-4-methylcoumarin (AMC)-containing peptide provided valuable structural insights into the regulation of SIRT1 activity by RES (46). In the proposed model, each SIRT1 can bind to 3 RES molecules (Figure 5A). Two of these RES molecules make hydrogen bonds with both the extended N-terminal domain (NTD) and the p53-AMC, while the 3rd RES molecule contacts the catalytic domain of SIRT1 (Figure 5B). The individual RES molecules are packed into preformed protein pockets in which a close network of hydrophobic and van de Waals interactions are possible (Figure 5C). Based on the proposed structure, RES serves as a molecular adapter bridging the NTD moiety and the peptide by principally interacting with the peptidyl-AMC on one side and via specific NTD residues on the other side. These interactions provoke conformational changes responsible for lowering the Michaelis constant value between the peptide to be acetylated and SIRT1. A, backbone drawing of human SIRT1 in combination with 3 RES molecules. The regions within the protein forming α-helixes are marked in red, while portions that are folded into β-sheets are given in yellow. The 3 RES molecules are given as ball and stick structures; B, A more detailed structure of a region within the SIRT1 protein forming physical contact with the RES molecules. The protein is given as a cartoon, while the ligands are given as ball and stick structures; C, Representative surface structure demonstrating the tight packing of RES into preformed protein pockets of SIRT1. Details about figure generation are given in the material section. More details about the structural basis on SIRT1/RES interactions are given elsewhere (46). Although there is nowadays mounting evidence for the assumption that RES mediates at least part of its beneficial effect through the SIRT proteins, some reports show that RES in vivo is not a direct activator of SIRT1 activity and that the pharmacological effects of RES in various models are unlikely to be mediated by a direct enhancement of the catalytic activity of SIRT1 (47, 48). Another crystallographic study proposed that the tyrosine-like phenolic ring of RES fits well into the active site pocket of the tyrosyl-transfer-RNA (tRNA) synthetase thereby nullifying its catalytic activity and redirecting this enzyme into the nucleus where it stimulates NAD+-dependent auto-poly-ADP-ribosylation of PARP1 (49). RES was also to bind to a hydrophobic pocket within the F1 catalytic domain of the mitochondrial ATPase. This binding should prevent both the synthetic and hydrolytic activities of the enzyme, thereby modulating mitochondrial ATP synthesis, calorie restriction, cellular proliferation, and apoptosis (50). 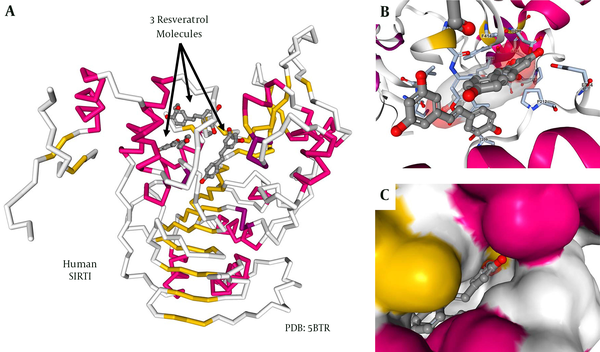 Moreover, a structure-based drug discovery study claimed RES as a binding partner for leukotriene A4 hydrolase (LTA4H) (51). This enzyme participates in arachidonic acid metabolism and plays important roles in immediate hyposensitivity reactions and inflammation. In the same line, RES binds into the substrate binding cleft of phospholipase A2 (PLA2) catalyzing the hydrolysis of phospholipids into arachidonic acid and lysophospholipids (52). This enzyme is of fundamental importance in the generation of anti-inflammatory and inflammatory mediators. In addition, RES binds to the ligand binding domain of the estrogen receptor-α, which renders another possibility to modulate inflammatory responses (53). The proposed therapeutic doses for humans are mainly based on arithmetical animal-to-human dosage conversions. Although independent validations show that a daily dose of 700 - 1000 mg/kg body weight is well tolerated and 2 g is harmless when applied in short-term, published evidence is presently not sufficiently strong to justify a recommendation for the administration of RES to humans (54). However, starting in 2010, several clinical RES trials aimed at critically evaluating the health-promoting effects of this stilbenoid in humans (55). In regard to the liver, the 1st phase I pilot study using micronized RES (SRT501), given as 5 g daily for 14 days to patients with colorectal cancer and hepatic metastasis, was published in 2011 (56). After application, the drug was detectable in hepatic tissue inducing a significant increase in caspase-3 in malignant hepatic tissue compared with the tissue from placebo-treated patients (56). In another randomized, double-blind, crossover study conducted on 11 healthy males with obesity with placebo and 150 mg/day RES for 30 days RES supplementation induced metabolic changes in individuals with obesity, mimicking the effects of calorie restriction (57). Similarly, a 2-week, high-dose RES treatment (1 g daily for 1 week followed by 2 g daily for 2 weeks) significantly reduced intestinal and hepatic lipoprotein particle production (58). In contrast to these reports, RES supplementation had no beneficial metabolic effects on non-obese, postmenopausal females with normal glucose tolerance when given at a dose of 75 mg/day for 12 weeks (59). Also, in a report from Australia comparing groups given 3 g RES (n = 10) or placebo (n = 10) for 8 weeks, RES was not efficient on reducing insulin resistance, steatosis, or abdominal fat distribution (60). Instead, there was a tendency that RES increased hepatic stress. A somewhat more encouraging result came from a randomized, double-blinded, controlled, clinical trial from Iran that enrolled 50 patients with NAFLD (61). Patients receiving 0.5 g trans-RES for 12 weeks showed a significant reduction in liver enzymes, inflammatory cytokines, NF-κB activity, and hepatic steatosis grade as compared with the ones received the same amount of a medium-chain triglyceride placebo. A rather similar study that enrolled 60 subjects with NAFLD, given two 150 mg RES capsules twice daily for 3 months, showed significant improvement of several biomarkers including liver enzymes, glucose, low-density lipoprotein cholesterol, total cholesterol, and insulin resistance index (62). In contrast to these encouraging studies, another very recent, randomized, clinical trial from Denmark including 28 patients with overweight found no indication that RES treatment (1.5 g RES/day for 6 months) had any consistent therapeutic effects (63). In line, a recent systematic review and meta-analysis study published during the revision of the current review concluded that the current evidence was insufficient to support the efficacy of resveratrol in the management of NAFLD (64). A detailed search in the Clinicaltrials.gov registry for clinical RES trials led to the identification of 13 clinical trials when using the search terms “resveratrol” and “liver”. After further screening, only 9 of these studies had a major focus on the analysis of aspects of liver pathogenesis. From these, 6 trials were completed, while 3 other studies are actually recruiting participants (Table 1). Without the studies mentioned before reporting beneficial effects of RES in the treatment of colorectal cancer, hepatic metastasis, and NAFLD (56, 61), the ongoing clinical trials for which no results were reported yet aimed to evaluate proposed beneficial effects of RES in lipid turnover, liver fat content, hepatic steatosis, and insulin sensitivity. In all these studies, RES was dietary supplemented for 3 to 6 months. Actually, 3 studies recruited participants (NCT02129595, NCT02216552, and NCT02565979) with the major aim to analyze glucose tolerance and insulin sensitivity in pre-diabetes or in patients with NAFLD or metabolic syndrome. Although the estimated primary completion date of 2 of these studies was dates to January 2017 (NCT02129595, NCT02216552), no clinical or biochemical outcome of these studies were posted yet. Abbreviations: NAFLD, Non-alcoholic fatty liver disease; NA, not applicable; NSRP, no study results posted; RES, Resveratrol. aFor details about each clinical trial refer to https://clinicaltrials.gov/. bSRT501 is a micronized Res formulation originally developed by Sirtris Pharmaceuticals. cResVida is a 99% pure form of trans-Res distributed by DSM Nutritional Products, Inc. Since clinical trials testing RES as a liver therapeutic are still scarce and contradictory, it is presently hard to estimate the beneficial effects of this drug to treat human liver disease. Therefore, it is too early to recommend therapeutic application of RES in human liver disease. There is a mandatory need for future clinical studies with appropriate design and higher numbers of patients. These are urgently needed to clarify the true impact of RES treatment in patients with liver disease. During the past decades, the natural occurring resveratrol (RES), present in a limited number of dietary food products and beverages attracted much scientific and clinical interest. Independent studies showed that this stilbene lowered the risk of cardiovascular disease by reducing low-density lipoprotein (LDL) cholesterol, improving microcirculation, and inhibiting platelet aggregation. In the experimental models, RES ameliorated hepatic lipid accumulation, oxidative stress, inflammation, fibrosis, mitochondrial dysfunction, iron overload, and drug/alcohol toxicity. Presently, it is assumed that some of its health-promoting effects are mediated via activation of the SIRT protein family. These proteins act as critical regulators in metabolism and health span. Although some of the reported in vitro and in vivo benefits of RES on liver health are highly encouraging, well-designed clinical studies are still missing. Recommendation of clinical application of RES to treat liver disease is therefore still premature. With the present review, authors do hope to boost the scientific and clinical interest on the efficacy of RES as a drug to treat hepatic disorders. However, the evaluation of clinical or biochemical outcomes regarding liver health-promoting effects of RES in humans of course strongly depend on clinicians willing to support ongoing and future clinical trials aimed at increasing the knowledge on clinical or biochemical outcomes of RES supplementation to treat hepatic disorders. Abbreviations used: APAP, acetaminophen; CCl4, carbon tetrachloride; DENA, diethylnitrosamine; DMN, dimethylnitrosamine; HBV, hepatitis B virus; HCC, hepatocellular carcinoma; HCV, hepatitis C virus; HFD, high-fat diet; HSC, hepatic stellate cells; MCD, methionine-choline deficient; NAD, Nicotinamide adenine dinucleotide; NAFLD, Nonalcoholic fatty liver disease; NASH, Non-Alcoholic Steatohepatitis; NDMA, N'-nitrosodimethylamine; NF-κB, nuclear factor “kappa-light-chain-enhancer” of activated B-cells; NTD, N-terminal domain; PARP, poly (ADP-ribose) polymerase(s); PPAR, peroxisome proliferation-activated receptor; RES, Resveratrol; SIRT1, Sirtuin1/silent mating type information regulation 2 homolog 1. The authors wish to thank Mr. Hiroshi Moriyama for providing images of herbal plants. RW was financially supported by grants from the German research foundation (SFB TRR57, P13/Q03) and the Interdisciplinary Centre for Clinical Research at the Faculty of Medicine, RWTH Aachen University (IZKF E7-6). Authors’ Contribution: Ralf Weiskirchen: drafting the manuscript; Sabine Weiskirchen: performing proof reading of manuscript and preparing figures. Financial Disclosure: The authors declared no conflicts of interest.